Ray rice admitted to knocking out his wife and dragging her unconscious body out of an elevator and only gets a two game suspension? I know it’s his first offence but this isn’t a DUI, he knowingly punched his wife in the face and was given a ridiculously small suspension for it? To quote Adam Schefter “if anybody in this company[ESPN] or any company out there did what he did, do you think they’d be working for that company much longer? It’s hard to imagine that.” For a league where the reputation of the league comes first and it’s all about “protecting the shield” this was a massive blunder. It took footage to change anything. What kind of message is this sending? That as long as you’re not caught on camera, it’s ok? If the NFL wanted to make any kind of statement regarding their stand on Domestic Abuse this should have changed long ago. Whether or not TMZ had released the footage, Janey Palmer-Rice was hit just as hard and felt just as much pain and fear. It doesn’t matter whether there is a camera or not. 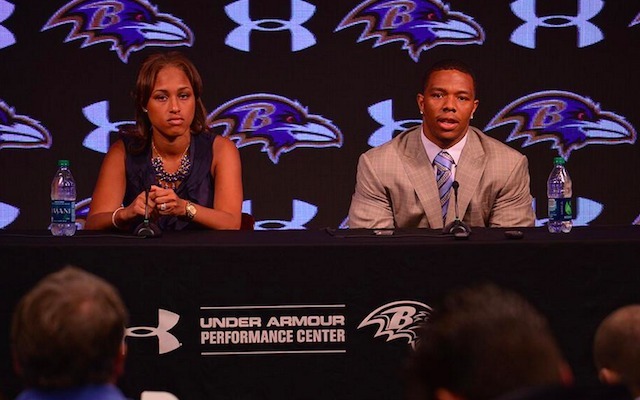 Ray Rice called a press conference about a month or so ago to apologise about the incident in Atlantic City. He apologised to the City of Baltimore, the NFL, the Ravens, teammates, coaches, sponsors and fans. The one person there was no mention of? The victim and his wife, Janey. So far Ray Rice has not apologised or done anything to show any public remorse. Not one. To the Ravens fans who wore Rice jersey to the game against the Pittsburgh Steelers, grow up. While you may feel that Ray Rice deserves a second chance it’s not going to be with the Ravens and if he is going to it will be in time not right away. The Ravens and Rice need a complete separation if Rice is to ever move past this. The main problem I have with it is this, you’re contributing to a victim culture and are selling out any morals you have and are like the player is above the law. By glorifying Rice and wearing his jersey you are suggesting that it must be the victim that is at fault not Rice. This isn’t just about this case though as other abuser will use this as justification. Secondly, you as a person and you as a fan are separate entities, of course you want to see your team do well but at what cost? Are you willing to condone domestic violence just so that your team does well? With wearing a Rice you’re doing more than just supporting you’re condoning it. Where was the NFLPA? When Ray Rice was suspended for the second time for the second time for same incident, the first thing the NFLPA should have done was lodge an appeal Rice’s behalf yet the NFLPA was nowhere to be seen. I feel the suspension is justified but the union should still have his back as that’s their job and that is what Ray Rice pays his subs for. Only at the start of this week after a firestorm of media attention did we hear of an appeal. Ray Rice WILL not play in this league again. Ray Rice will have to sit out this year at the very minimum and will be 28 years old when returns and this would be ok at other position but not at Running Back. With 6 years as the workhorse behind the Ravens success and approaching 30 and likely to be looking for a large salary, he won’t be all that attractive before you consider the media backlash. Now more than ever NFL teams are willing to take chances in younger Running Backs rather than overpay older backs who have wear and tear. I really want to believe that the NFL never got the footage the footage of Rice and were only relying on Rice’s testimony and that of his wife’s but I find it hard to believe. I have been a fan of Goodell’s and have taught that he has gotten most things right (the only other blunder being Josh Gordon’s suspension) but I simply do not believe that the NFL could not get their hands on it if they so choose. It’s the NF-freaking-L, if they were able to hire a former CIA man to head up their investigation into the case they would have been able to get their hands on the tape. Goodell could take note from NBA commissioner Adam Silver’s strong stance on the Donald Sterling. Obviously Janey Palmer-Rice and Ray Rice are committed to each other and I don’t feel it’s my place to raise questions as to why she is still with him but the timing of their marriage stinks. Ray Rice was indicted on third degree aggravated assault on the 27th of March. Rice and Palmer got married on the 28th of March. Also coincidentally law says that testifying against a married spouse is optional. While Rice and Palmer have a child together and were engaged it still seems like their might have been some other motives to this decision. The fact that Rice got into a pre-trial intervention program rather than having his case go to trial. So unusual that it happens in 0.5% of similar cases. Without a chief witness/victim it probably would have been difficult case to pursue but it isn’t difficult to see that Rice might have gotten some preferential treatment. Adrian Peterson and Greg Hardy deserve to play. For a player to be suspended without any conviction goes against a person constitutional rights, that you’re to be presumed to be innocent until proven guilty, Greg Hardy and Adrian Peterson are two cases which are completely different to Rice’s and deserve to be treated as such. While it is understandable that their respective teams don’t want to be associated with someone who is being charged with Domestic Violence and Child Abuse but NFL careers are short enough with players being suspended for crimes they may not have done. Right now they are being denied their right to habeas corpus. Panthers: too good to be true? As I am a Panthers fan myself, I am all too aware that our wide receiving corps is below average. 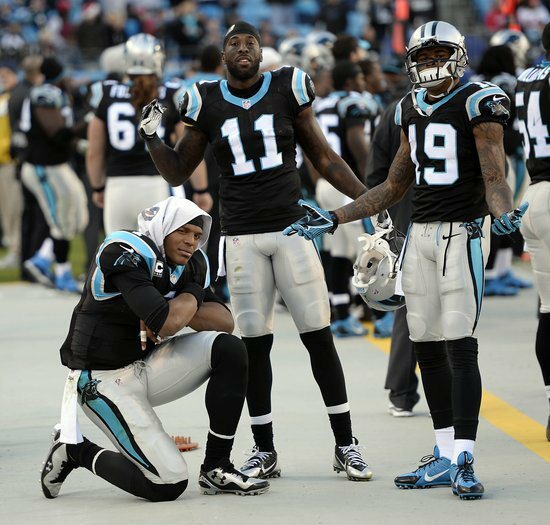 Last year we had household names at wide receiver in Steve Smith(who for some reason we decided to release), Brandon LaFell(went to the Patriots in FA) and Ted Ginn Jr.(left for Arizona during FA). LaFell’s absence leaves us with a lack of speed in our offence. Hell, all those WR’s absences leaves us with a lack of speed at our wide receiver position! But, in particular our punt returning and kick returning area. Ginn and LaFell were our main choices at that position. Who is going to fill that space? Because it sure isn’t going to be our 1st round pick Kelvin Benjamin who in my opinion was a reach in the first round. We could easily have picked him up mid second round. Anyway, with the departures of Ginn and LaFell the task shall fall upon Fozzy Whitaker our at best third choice Running Back who does have some experience from NCAA and filled the same role for the Browns last season after Travis Benjamin went down. Another reason why I believe that our start was too good to be true is due to the cloud of confusion hanging around Cam Newton’s fitness and also our secondary’s strength. Cam played well enough in his opening game but did show some signs of sluggishness in the pocket and one or two of his decisions were quite questionable. I, like any other Panthers fan, hope that he gets back to full health and resumes last years form. 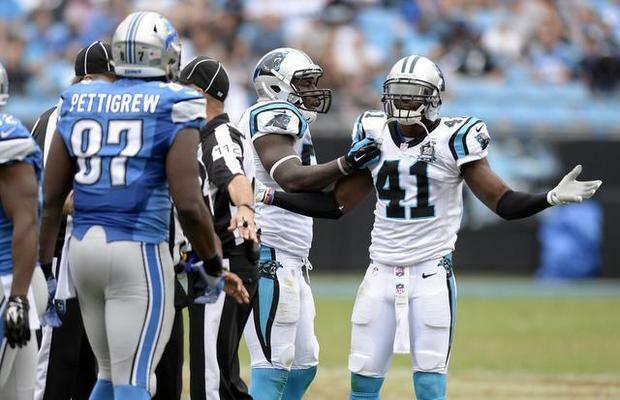 In saying this, the way Derek Anderson against the Bucs I won’t be overly worried if (touchwood) Cam does get injured. On Saturday Penn State and UCF played in the first ever Croke Park Classic and it truly was a classic. It was the first American football game I had actually attended in person and it was great. We arrived at 10 in the morning so as to soak up the atmosphere. It soon became apparent that there were far more Penn State than UCF fans after making the trip. When we reached the tailgate party in Temple Bar there were already plenty of people around with a mix of Penn State and UCF and plenty of Irish fans as well. With the Irish fans most were wearing their favourite NFL team’s jersey with a wide mix with everything from Dan Marino to Randy Moss to Johnny Manziel. With the pre-game festivities over it time to head to the game. The free bus service from Temple Bar to Croke Park was exceptionally handy and it made the journey a lot easier for us. When we got there it was twenty minutes before the game and even though the UCF announcer was trying to get the crowd excited to be honest tge atmosphere wasn’t great before the game because the crowd was late arriving before the game. Even when they did arrive, the stadium wasn’t very full with only 55,000 of the 82,000 tickets sold out and the stadium wasn’t really suited to the game either as the pitch was far smaller than a GAA pitch is. The game itself got off to slow start with Penn State leading 10-3 as both teams looked lethargic with UCF QB Pete DiNovo looking particularly bad before being replaced in the second drive of the second half by Justin Holman. DiNovo finished the game 3/8 for 18 yards as Blake Bortles presence was missed sourly in the first half as was Storm Johnson’s as the team had 24 yards on 29 attempts and had negative rushing yards at half time. Holman was a breath of fresh air when he did come on going 9/14 and TD in the air with 2 TDs on the ground as well. With 3:30 left on the clock and Penn State up 23-17 Holman lead Penn State down the and converted a 31 yard pass on 4th and 10 thanks to a great pass by Josh Reese. Holman then ran it in on a QB draw on the play to put UCF 24-23 with 1:13 up. With 1:13 left in the game Penn State came back on the field. Hackenberg who had lead Penn State on a similar drive last year to tie the game against Michigan lead Penn State down the field even tucking and running on a crucial 4th and 3 for 8 yards. Then kicker Sam Ficken kicked the game winning filed goal as time expired. The Penn State bench then ran onto the bench before the Dan Rooney trophy was awarded to the Penn State. The trophy is named after former US ambassador to Ireland and Pittsburgh Steelers owner Dan Rooney and is made out of Irish Bog Oak. Mr Rooney was there himself to present the award. Although the crowd turned out to be a little disappointing it was still a great game.